Add a phone number field to a form when you need a value submitted in a specific format. By default, a Phone Number field checks if the value entered is a valid phone number. Several types of phone number formats will be accepted. The field can easily be modified to allow a specific phone number format or any other alphanumeric format, including social security numbers and zip codes. Beyond that, you can use a regular expression (regex) to enforce virtually any format that you want. 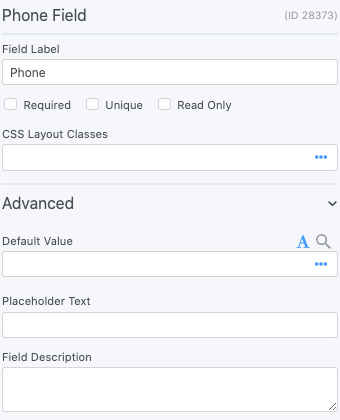 The default value icons can be used to specify whether the text entered in a Phone Number field on the form builder page should be a default value or a placeholder. 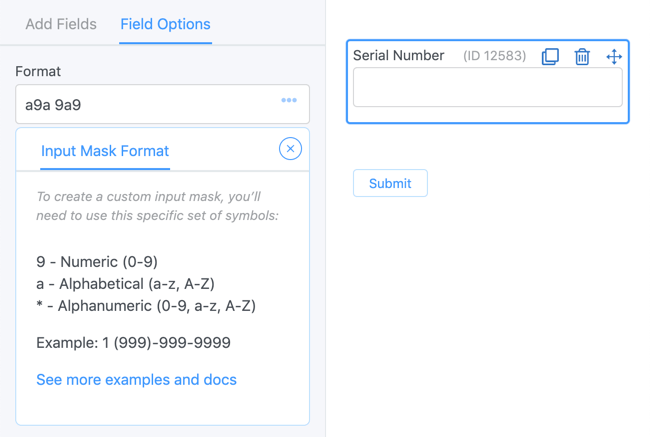 Learn how to set a default value and how to set a placeholder in a Phone Number field. Display the value submitted in a Phone Number field in a form's confirmation message, email, or View. Just insert [x], where x is the ID or key of the Phone Number field.